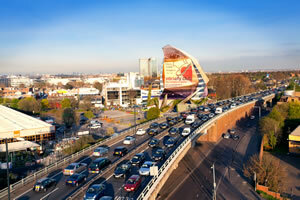 The controversial ' Octopus' development near Chiswick Roundabout has been given the go-ahead by local councillors. The scheme, which includes an iconic LED 'shroud' around a large office and retail development will be allowed, subject to stringent conditions relating to advertising, lighting, and job creation. Revised plans had been submitted to Hounslow Council for the development which is expected to provide over 300 jobs at the Gunnersbury Avenue site. The scheme was debated at the Sustainable Development Meeting on Thursday ( October 27th). One of the stipulations imposed by councillors was that the so-called ' shroud' which will surround the building, be used only for ' artistic' purposes and not advertising. 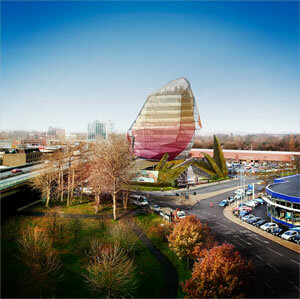 An earlier design was refused permission by Hounslow’s Planning Committee in March 2010. One objection was considered to be the impact of the advertising space on highway safety, especially on the M4 motorway. Since then, a public inquiry has been held into this issue which resulted in a judgment in favour of London & Bath Estates, with the Inspector concluding that there was no adverse impact on highway safety. The scheme, designed by architects MAKE, provides 4,800 square meters (52,000 square feet) of office space, a retail showroom at ground level, new landscaping, a rooftop public viewing gallery and an LED shroud around the building. The developers say the majority of residents supported the scheme with 137 letters in support and only 8 objections. English Heritage did not object to the scheme and the revisions are aimed to deal with points made by the Commission for Architecture and the Built Environment. The revised application was for a building that is 3m less high than the previous one. It also increased the amount of office space and added a new 305 square metre retail showroom space on the ground floor. There is now a viewing gallery and a rooftop garden which will be open to the public. The east facing motorway level advertising screen, which had faced the roundabout and the Thorney Hedge Road and Wellesley Road conservation areas were also removed and the west facing screen has been reduced in size. A new glazed grand entrance, on Gunnersbury Avenue had been added and the car park relocated from the surface to a basement level. The scheme incorporates a number of sustainability measures including solar shading, borehole cooling and rainwater harvesting. Kim Gottlieb, Managing Director, London & Bath Estates said last year that the developers had made major changes to the original design. “Over the past year we have taken on board a range of comments, made some significant design changes and resolved the critical issue of highway safety."